MALAYSIANS will now get to enjoy jade perch (fei chui pan in Cantonese), a new organically grown fish species that originates from Australia. 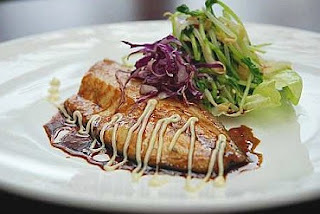 Extraordinarily high in Omega-3 oils, it is a popular fish in a number of Asian countries. Omega-3 is essential for promoting proper nervous system and mental function, and maintaining healthy cholesterol levels. Research has proven that the high intake of 0mega-3 fish oils can reduce the risk of cardiovascular disease, Doctors recommend 400mg of Omega-3 at least twice a week to reduce the risk of heart attack. Fish (Asia) Sdn Bhd, a subsidiary of Protech Yu (Asia) Sdn Bhd, markets this fish in a joint-venture with Goldish Berhad. Jade perch, a freshwater river fish, gets its name from the distinctive greenish colour along the top of its body when light is "efiected off the scales. In Australia, it is mown also known as striped perch. During the launch and food-tasting of the fish dish at Isthmus restaurant in Kuala Lumpur. Protech Yu chief operating officer long Kheng Loong expressed confidence hat Malaysians would enjoy this novelty ish because "it is easy to cook, healthy, and tee of contaminants due to the Protech lquaculture system used to breed it". With lelicate flesh, it is also being promoted as m ideal fish for the health-conscious, young children and pregnant women. can reach up to 2kg or 3kg and such bigger fish are supplied to hotels and restaurants. Goldish head of corporate investment Colin Ng said the jade perch is now being reared in Kuching under a pilot project managed by Protech Yu for about two years. He added that about gM10mil has been set aside to build an integrated facility in Kuala Kubu Baru, Perak, which will include processing and logistics in the farming of the fish. Yong said the Kuala Kubu Barn farm can supply jade perch commercially by the end of October. 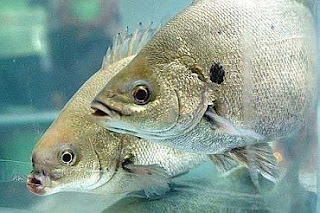 The fish is farmed under the land-based aquaculture technique known as the fish protech controlled aquaculture system (fishProtech CASk which has been successfully commercialised in Australia for over two decades. Protech Yu is the master licensee of the system in Asia. Invented by Australian entrepreneur and engineer Johan Don, the system is a proven aquaculture technology of rearing andbreeding of freshwater and marine fish in indoor tanks using a fully integrated, climate-controlled, water management system. In Australia. fish sold under the fish Protech CAS brand command a premium in the marketplace. The system produces organically farmed fish guaranteed free of chemicals, antibiotics and other pollutants. Fish bred using this technology are said to be free from diseases commonly associated with other outdoor aquaculture methods. It uses treated water, organic feed and specific pathogen-free fingerlings. Don. who is CEO of Fish Protech Australia. said: "The jade perch has been organically grown in Australia since 1999 and the Australian barramundi (sea bass), since 1988." The jade perch's rich natural oils and soft flesh make it easy to cook. It is said to have a high Omega-3 oil content, that is. 2.4g for every 100g of flesh, which is far higher than what the Atlantic salmon yields (1.8g for every 100g). At Isthmus. 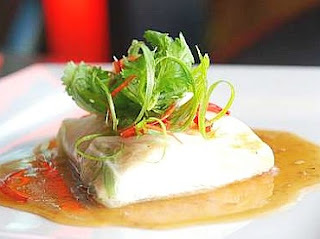 a fine Asian cuisine restaurant in Mid Valley City, jade perch is served in two innovative ways. Kudos to head chef Mohd Zaini Sand for his excellent dishes. In the starter, Steamed Jade Perch Parcel, the fish fillet is wrapped with Chinese cabbage to retain its tenderness and then steamed. Chinese cooking technique is employed to infuse the dish with light flavours of soy, ginger and sesame oil for fragrance. The main course, Teriyaki Jade Perch with Bean and Pea Sprout Salad, is a must-try. The fish is pan-seared in olive oil and further grilled with Teriyaki sauce, giving it a delicate sweet taste reminiscent of grilled unagi. It is served with bean and pea sprout salad and topped with wasabi mayo. If I need buy the jade perch and golden perch, where can buy? I want to buy and sell Jade Perch. Who do I contact to get further details. Email me at carlkalaiselvan@gmail.com, i can provide you with fingerlings.